Think of religion as a kind of tapestry. The warp is belief and the woof is practice—the art, ritual, and embodied experience of the religious life. 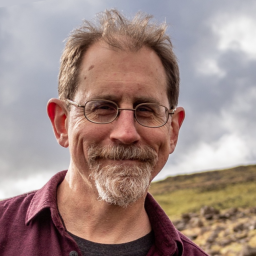 There is no practice without a structure of basic beliefs or assumptions, of course, but at the same time, you can’t reduce practice to beliefs. This is one of the many small-hearted mistakes committed by today’s flatland atheists, with their tin-eared harrumphing before the poetic mysteries of the religious imagination. So much more interesting to open the nerves to the practices of religions one rejects ideologically! After all, the worlds of religious practice—with their deep wells of feeling, ecstasy, song, gesture, costume, and rite—can be transformative not only to the practitioners in question, but to those admirers who stand outside the gates. 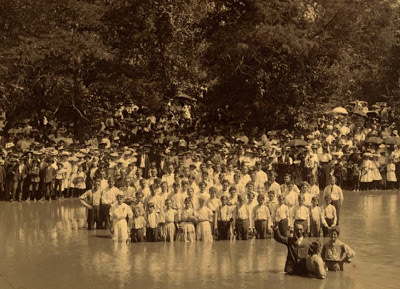 Take one of the core practices of American Protestantism: the river baptism. The fetish for the new-born life that motivates the psychology of Christian conversion may be a rickety construct, but its expression as a full-body plunge into actual waters is a sight to behold. Jim Linderman thinks so too, which is why he has been obsessively collecting vintage photographs of immersion baptisms, some of which have now been gathered into Take Me to the Water, a remarkable book of sepia-saturated photographs from the first half of the last century. These elements also pour into the music of baptism, which has also been collected and curated on the marvelous CD that accompanies the book. These recordings, mostly from the 20s and 30s, cluster around images of water, rivers, and the fundamental metaphor of cleansing. There are scores of variants of “Wade in the Water,” drifting along the ceaseless flow of borrowing and mutation that marked American vernacular music of the day, as well one of the more haunting renditions of “At the River,” which has been my favorite American hymn since I fell in love with John Ford movies two decades ago, and later with Charles Ives, who also dug it. As a package, Take Me to the Water is one of those perfect objects that seems to have emerged from the creative constraints and opportunities of our imploding media moment. After all, selling CDs just isn’t that fun anymore, let alone profitable. But the paring of those plastic binary wheels with books is a form that, while hardly new, may be coming into its own. If so, Take Me to the Water is a paragon: elegantly designed, accessible and strange, with just a few dollops of data and text, and everything else a series of images whose stains and cracks only intensify the texture of time. It is no surprise that the crew behind this little jewel is Dust-to-Digital, the award-winning 78 revival outfit who, along with the more minimalist Mississippi Records, have put out some of my favorite collections of dead people music over the last handful of years. Dust-to-Digital’s Goodbye Babylon, whose gorgeously designed, cotton-packed box almost matches the revelatory excellence of the American religious music that it contains, remains without doubt my favorite multi-CD collection of recent memory—the only imaginable runner-up to Harry Smith’s famous Anthology of American Music. Both are a constant source of weirdness and light in my life. In many ways, Take me To the Water is like an appendix to that great collection—or rather a preface, since the experience of transformation embodied in the full-body plunge is the ever-repeated dawn of the religious life.